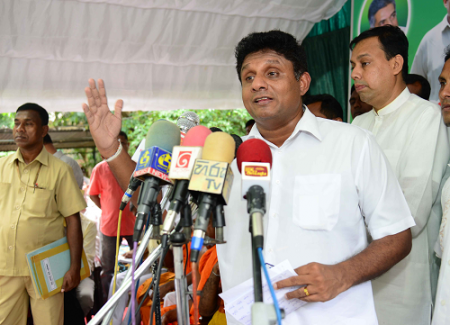 Housing Construction Minister Sajith Premadasa said today his ministry would launch housing projects called Udagama to be named after past leaders of the country, be they dead or alive. He said one such Udagama would be named after former President Mahinda Rajapaksa. He told a news conference 'Gam Udawa or the Village re-awakening programme' initiated by his father the late President R. Premadasa, would be re-launched by the middle of this year. While addressing the media, he said that a newly constructed village called ‘Sanhindagama’ would be opened on next Sunday in Hambantota. “The Sanhindagama village consists of thirty houses including all infrastructure facilities. We are hoping to build villages to be named after all former presidents and rulers of Sri Lanka,” the Minister said. He said housing loan facilities would be introduced for the first time for state sector employees by the National Housing Development Authority(NHDA). A decision was taken to give priority to the defence sector, he said.